I'd love to see independantly what the custom list of pan-Unicode and script-specific fonts that gives 99% coverage is. Preferably organised by coverage, showing how many font you need to get an already really good coverage. Also I thought this would be very fast an exercice in seeing a lot of chinese characters go by, but I was surprised to see that they are more than 10 000 non-Chinese characters before you get to that huge block of Hanji. It's fun, but I'm missing the Birmanese font, would have love to see what those characters look like. I've planned for a long time to write a blog post entitled "How to get 100% Unicode coverage" which lists what fonts you need to display what Unicode scripts/blocks, but every time I get close to achieving 100% a new version of Unicode is released with thousands more new characters, and so I've never yet manged to achieve 100% myself and I've never written the post. In particular, I do not know of any freely available font that covers these blocks: Mandaic, Balinese, Batak, Lepcha, Vedic Extensions, Bamum, Common Indic Number Forms, Devanagari Extended, Rumi Numeral Symbols, Brahmi, Kaithi, Bamum Supplement, and Variation Selectors Supplement. Because of comment length restrictions, I cannot provide the custom font list here and now, but I will give a detailed answer in the post this evening. I have now inserted in the post a link to the custom font list used and download links for the freeware and shareware fonts included. Suggestion: stop using the "b" element, or reset the font-weight back to normal. Why? Because some characters are rendered incorrectly because the browser (or the operating system, I don't know) tries to "emulate" the bold font by increasing the thickness. This happened for me in both Opera and Chrome under Linux, I don't know about other systems. Things get very bad for "picture"-style characters. For instance, the ones from "Block 191 : Playing Cards". Thanks for the suggestion -- I have removed the bolding now. 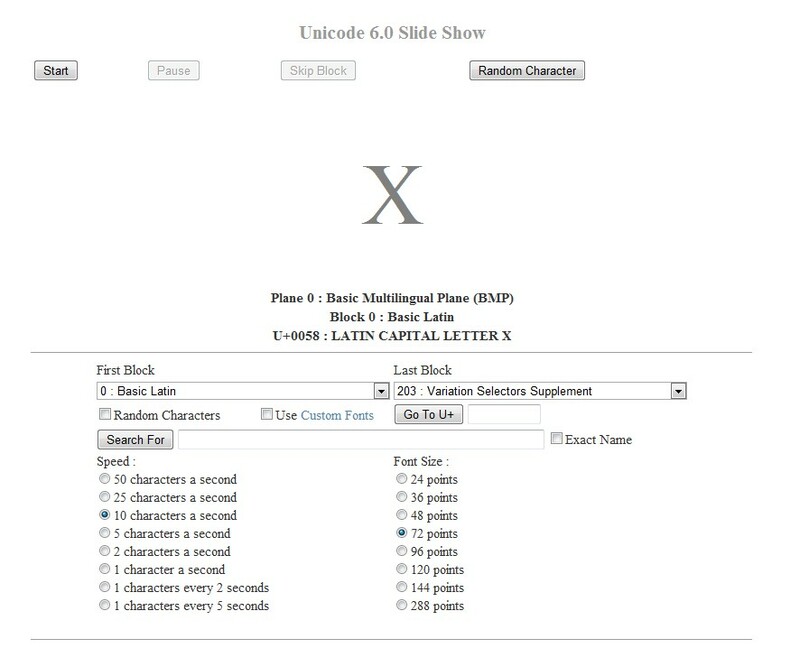 I am new to this study of Unicode glyphs, fonts etc. I am interested in the Malayalam Language and want to see how I can make a distinction between two forms of a letter `na' : Alanwoods Resourses Characterlist for Malayalam Decimal 3368 Hex 0D28 Malayalam letter NA ന. One is pronounced as this NA itself and the other its phonetic variation a dental one. I have to design a new symbol for this and make all the glyphs necessary to show how it combines with other letters. Can you help where to start reading? Hi Partha, I'm afraid that I am not really the best person to answer such a question. I suggest that you subscribe to the Unicode public email list where there are many experts who should be able to answer your questions.